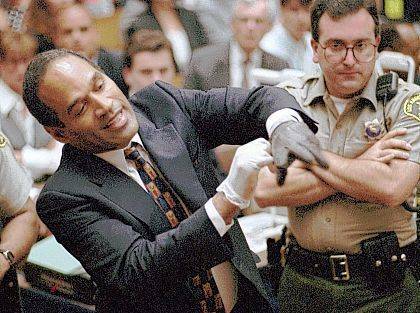 In this June 15, 1995, file photo, O.J. Simpson, left, grimaces as he tries on one of the leather gloves prosecutors say he wore the night his ex-wife Nicole Brown Simpson and Ron Goldman were murdered in a Los Angeles courtroom. 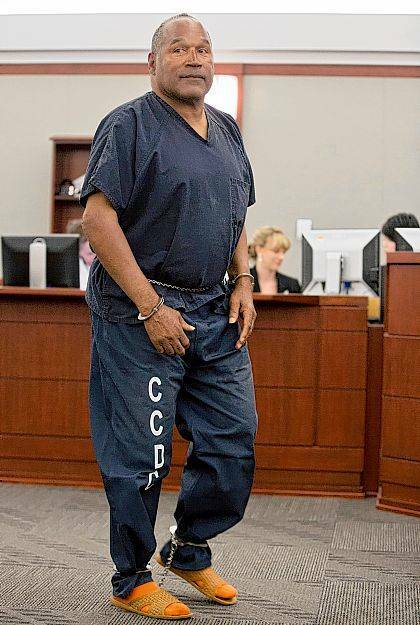 Simpson, the former football star, TV pitchman and now Nevada prison inmate, will have a lot going for him when he appears before state parole board members Thursday seeking his release after more than eight years for an ill-fated bid to retrieve sports memorabilia. 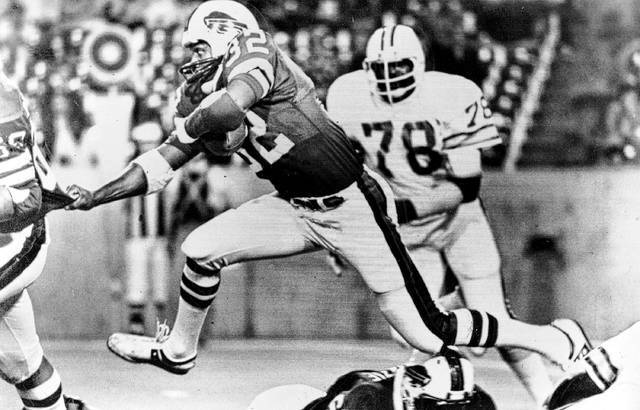 In this Sept. 3, 1977, file photo, Buffalo Bills’ O.J. Simpson (32) runs past Tampa Bay Buccaneers’ Council Rudolph (78) during an NFL football game in Buffalo, N.Y. Simpson, the former football star, TV pitchman and now Nevada prison inmate, will have a lot going for him when he appears before state parole board members Thursday seeking his release after more than eight years for an ill-fated bid to retrieve sports memorabilia. In this May 15, 2013, file photo, O.J. Simpson returns to the witness stand to testify after a break during an evidentiary hearing in Clark County District Court in Las Vegas. Simpson, the former football star, TV pitchman and now Nevada prison inmate, will have a lot going for him when he appears before state parole board members Thursday seeking his release after more than eight years for an ill-fated bid to retrieve sports memorabilia. LOVELOCK, Nev. (AP) — O.J. Simpson once thrilled crowds as he ran for touchdowns and hurdled airport seats in car rental ads to achieve Hollywood celebrity before he was acquitted of murder in the 1995 “trial of the century” in Los Angeles.